I Yogesh Bhoir resides in Mumbai and my Education Qualification is B.com and PG in Accounting, Taxation and Business law from last 15yr working to give solutions on Indian Economy. I have solution plans on Debt Free India, Recession Free India, Inflation Free India, Unemployment Free India, Tax Free India, Reduce Administrative cost of the companies, Solution on Bank Non Performing Assets and Solution on Digital Disruption in India because due to automation 69% people lose their jobs. For this purpose. I have prepared New System for India so that people will not lose their jobs and also I will create 5crore new employment and around 50 lakh every year employment. Everything is planned Fund require for execution of plans. I want to establish Service Industry Regarding these above plans. https://newrevolutioneconomy.blogspot.com / https;//yogeshentiresolution.blogspot.com and https://NewArthakranti2010.blogspot.com. 1. Write briefly about your organization. How did you start? What was your inspiration? I am one man Organisation. It is about financial Service. Since 2001 started thinking on this unique Idea Because I studied about India since 1947 lacking in finance, due to finance problem we are under develop country. We are developing our country by given grants of other countries. Presently we are developing by taking debt from World Bank, IMF and FDI. Big Entrepreneur are not bother about our country in Debt (Reliance, Birla and Tata). So I have decided to become self-sufficient in Finance, not to depend on World Bank, IMF and FDI. My Inspiration is Former President A.P. Abdul Kalam Statement “Our youth should be trained as an employment Generator Greater than Employment Seeker” and our country labour force we have in India to encash it. We have skill, Material, power, labour, Fixed Assets and only we do not have is Finance. Financial service mean not giving loan it is to reduce debt, reduce inflation, stop recession, reduce unemployment, reduce Tax, Increase Export, reduce dollar rate. 3. Pitch your solution what is your solution to solve this problem? I am trying to solve the problem of Debt, Inflation, Recession, Unemployment, tax, Increase export and reduce dollar Rate. For these purpose I have prepared plans: - Debt Free India plan: this plan reduce debt of our country and give employment to 5 crore people excluding 50 lakh employment every year. Inflation Free India plan: this plan reduce Inflation burden of society people and Expenses turn into saving in banks, Recession Free India plan: this plan Reduce Administrative cost of the companies, Debt and generate employment, Unemployment free India plan: This plan connected to all other plans, Tax Free India plan: this plan reduce tax burden of people in India and increase Export with reduce Dollar Rate. For Facts and and information: my website: https://newrevolutioneconomy.blogspot.com . Upload photos and video to your campaign.A youtube video works the best. 4. How many people will be positively impacted and in what way? These problems are universal and its affect all countries, solutions to solve Inflation, Recession, Debt, Unemployment, Reduce tax burden of people will be positively impacted because everybody is suffering with these above problems. 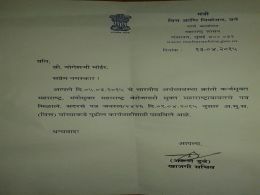 I had send letter to CM of Maharashtra, RBI, PM of India, President of India. For this purpose I get Response, It is for Bright future of India and Other countries as well.